Why are there no black speedsters? I mean it does make alot of sense. I'm not trying to turn this into anything racial, but African Americans do hold 28 of the last 38 100 yard dash records. Not sure if Impala of the Global Guardians is considered a speedster. Because it's resist for black people to run fast. Also Whiz Kid is a black speedster. African "Americans" or just black competitors? i'd don't see anything wrong with having a black speedster. what i hate is that black characters powers aren't that creative and character development compared to the A-list heroes. Because the cops would constantly be pulling them over. See the Flash avoids Kenya because no one is impressed there. That's so true, but at least they're cool characters. @Pfcoolio15: The Flashes are powered by an extradimensional source. Theirs isn't a physical power. Race doesn't play a factor here. Does XS not rival the other Flashes at all? Dammit I came here specifically to make an electricity joke. :( You stolez it from us. I'm not saying race plays a factor. I'm just saying that with the circumstances in real life, you'd find it possible to find one competent black speedster in comics. It doesn't always have to be someone with the last name Allen or west that the speed force picks. No offense to the OP, but I always find these threads annoying. There are no Flash level black speedsters because no one has made one yet. It's really as simple as that. Do people really expect the comic industry to churn out a token black super hero for all the iconic powersets? There you go another speedster. Damn BlackBolt, I know its true but Damn. You do know that one member of said top level speedster family is black? You know, I never got this. To my knowledge there are a total of three electricity wielding black dudes, two of which are direct homage/expy of the first one. Where did this idea come from? because there's an alternate universe where Flash is black. @Mega_spidey01: He can take on an electric form and travel on power lines and the like. And Electricity only moves at one speed. That one made me laugh pretty hard. I would point out that Flash level speedsters as a whole are rare. Indeed there are very few speedsters on that level and most of them are Flashes themselves and thus possess the same powers even if their output is different. I think all the non-Flash speedsters at Flash level could fit in a thimble and the amount outside of DC without the Flash as a comparison would probably be almost non-existant. Because comic book companies are racist. Not really a speedster though. More of a flying brick. I don't think I've ever seen him actually run, just fly. @xxxddd: That's neither here nor there. The relative merit of the characters isn't the point. They merely prove that, contrary to the topic header, there are, in fact, black speedsters. @Jorgevy: That's not the point I'm trying to put across my friend. Let me make it clear for you. 494 of the 500 best ever 100 meter sprints are held by people of primarily West African origin. Black sprinters literally dominate the roster for track and field. The fastest man in the world is Usain bolt of black origin. Even dominantly white countries have black people represent them in the Olympics. If you watched the Olympic trials you would know what I mean. It's not even fair. So explain to me. 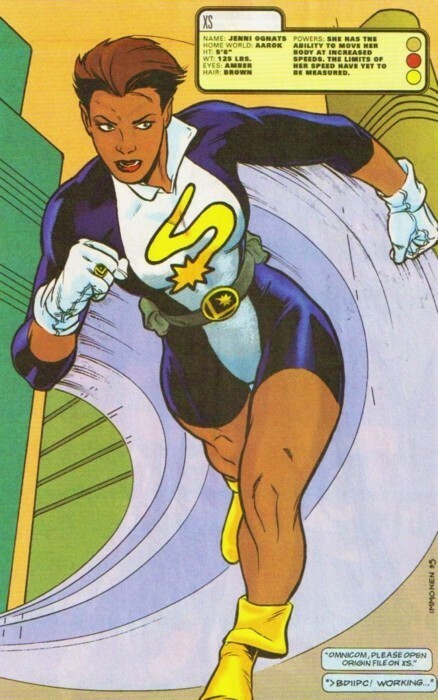 Wouldn't it make sense for at least one black character to be close to the flashes speed. The best that's been shown on this thread goes 300 mph per hour. Which you know is a joke. no because it has nothing to do with it. what's the importance of skin colour? and if you said West africa, why did you ask for blacks in general and not western africans? Yea theres the Blur and I don't know if she is black but Blitzen from Shadow Cabinet. Then there is Riot from Heavy Mettle from the Supreme comics, and Godspeed from Image as well. And also would it not be more Racist to give all the Black Hero's Super Speed. Maybe the ability to carry many objects at one time. That would be racist. Oh and his fav/their favorite off duty eatery is Either Mcdonald's or Popeye's Chicken. This is racist. @Jorgevy: No I didn't say skin color has anything to with it. And as for the West Africa thing. Well, I don't know if you know this, but West Africans are black. And also ALL black people originate from Africa. That's why I said PRIMARILY of West African origin. Usain Bolt is Jamaican as well as as well as Yohan Blake. Tyson Gay is African American. These are three of the top 10 fastest people in the world. And the top 10 fastest people in the world are all black. I didn't say skin color had anything to do with it, but statistics don't lie. I'm just saying that if they're that fast, then it would make sense that a black speedster could go at least close to flashes speed. Not just 300 mph. And another one is Canadian, my bad. @Pfcoolio15: that wasn't the initial point of the thread, the whole 300 thingie and also, you said West Africa, so your question should be about West Africans, because those were the "statistics" you used.unless you comitted a mistake and just used West Africa to englobe all black sprinters. also statistics do lie, and pretty often. and furthermost, yeah, a bunch of black guys are fast in real life? WHAT does that have to do with comics? I mean if I go and find out that all the record holding heavy lifters had green eyes Im gonna question why there aren't enough green eyed guys with super strenght? no! because its ridiculous to think that something in sports would be associated with a physical trait and then correlate to some kind of super power in comics. @Jorgevy: Honestly, I doubt any comic book writer would go so deep as to point out that this black person is from this specific region of Africa. And I said that they have West African origins, not that they are specifically West African. Like I said, all black people are from Africa which is why I said that. And as for the statistic I pointed out, it isn't a lie. It's proven. And also, for the guy that chased the Flash. I don't really consider him part of it because he's just an Avatar for Death and there's also the fact that he doesn't actually run. He uses skis like the silver surfer. So that's not really what I categorize as a speedster. The other speedsters in this thread, aside from Jenni, they do all go under 300 mph as the blur is the fastest one here. And I don't think Zip zap is going anywhere near that in a long time. And Jenni doesn't hit light speeds. The correlation I put forth is a lot more relevant. Anyone can be strong just as anyone just as anyone can be fast. But when you have the Flash going 7x the speed of light and apparently blur can die if he goes his top speed for longer than a couple of minutes. Then there's something wrong. Ya. And I got like three black speedsters. One of whom happens to be half Allen. I'm not saying that physical real world statistics have anything to with it. I'm just using them to support my point that there should be a bit more black speedster don't you think.